Martin Freeman ends up hitchhiking through space after Planet Earth is destroyed to make way for a bypass. Useless schoolteacher Neil’s (Simon Pegg) biggest problem is trying to impress his neighbour Catherine (Kate Beckinsale) and make her fall in love with him. But Neil’s life quickly collapses into chaos when a group of power-crazed aliens (voiced by the Monty Python cast) grant him the ability to make absolutely anything he wants happen with just a wave of his hand. Fans of the film adaptation of Douglas Adams’ Hitchhiker’s Guide To The Galaxy will easily find something to like here. 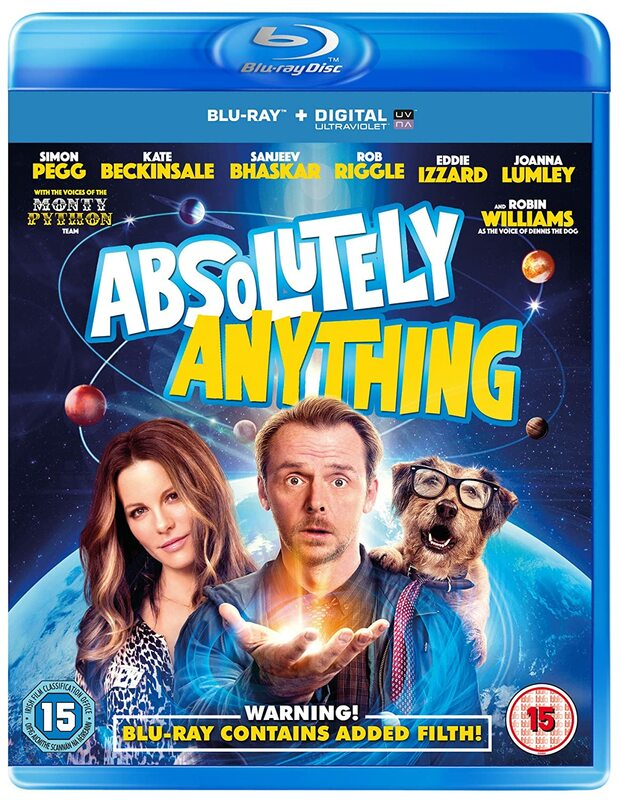 Absolutely Anything is on the same branch as Hitchhiker’s humour-wise, and ranges from clever syntax to visual gags, one of which involves a pair of dog turds standing up like legs and walking themselves to the toilet. It’s not quite as grand as Hitchhiker’s, or quite as original, and it has a remarkably made-for-TV film feel to it, but it’s difficult to pin down the cause. However, it’s still entertaining and charming, and has a lot of heart. Occasionally the gags don’t quite hit the mark. Rob Riggle’s character, a terrible ex-US Army officer who hounds Catherine and calls himself her fiancé even though she repeatedly insists that she can’t stand the sight of him, is rarely amusing. It’s clear he’s supposed to be an awful person, but his dialogue is creepy and annoying rather than engaging. In contrast, appearances from Joanna Lumley and Eddie Izzard are delightful, but they’re also very brief. The late Robin Williams is marvellous and consistantly funny and adorable as the voice of Neil’s excitable dog Dennis, who gets granted the ability to speak human by Neil’s new powers. As the film was Williams’ last before he died, some lovely clips of him voicing Dennis in the recording studio are included at the end as the credits roll, which finishes the film off beautifully.